On June 17th, gamers will be able to pick up titles at kiosks for $2 a night. This might not come as a surprise, but Redbox is doing well. The DVD rental kiosks have expanded to Blu-ray and are now expanding even further - to videogames. 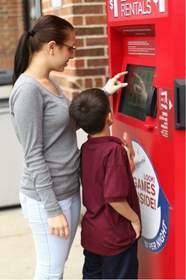 Redbox says that over 21,000 locations will offer videogames at a price of $2 a night. This is after a successful test that began in late 2009 and will add to the $1 DVDs and $1.50 Blu-rays currently offered at Redbox Kiosks. "With more than 21,000 redbox locations slated to feature video game rentals alongside movies this June," says company president Mitch Lowe, "redbox will be the one-stop shop for entertainment."